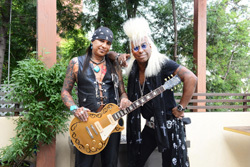 Their history dates to the early Nineties when Jean Beauvoir and Micki Free formed Crown Of Thorns, a pearl of a melodic rock band in the midst of grunge. Whether by fate or providence, the melodic rock gods have pushed the winds of fortune to unite the two friends for a new musical collaboration, Beauvoir/Free and a new album American Trash. You can watch the video EPK below to get a sense of the Beauvoir and Free's musical chemistry, but I'm guessing these songs came as naturally as breathing for the guys. Simply, this is classic melodic hard rock in an AOR wrapper in its finest form. Beauvoir and Free work from the core of melody of harmony, whether by the guitar lines or vocal arrangements. The song arrangements, as a whole, turn on these things while hooking you with an abundance of groove, catchy lyrical turns, and frightfully fiery guitar work, solos abound here. It's everything you love and want in AOR melodic rock. There's some pure rockers here, heavy and edgy, with Angels Cry, Whiplash, Shotgun to the Heart and There's Not Starting Over. The latter two have a near heavy metal edge in their sharpness, more so in Shotgun to the Heart. Beauvoir/Free can dial it back as well. Both Morning After and Cold Dark December have this churning groove favored by thick riffs. Morning After has this subtle symphonic angle that becomes clear in the later third of the song. Yet some of the best songs come in the form of catchy, nearly hypnotic, ballads. Both Just Breathe and Never Give Up turn on the inherent pleasing melody, but also the terrific harmonious vocal arrangements; pretty amazing on the latter song and the guitar solo just kills. As said earlier: American Trash is fine AOR melodic hard rock from two talented musicians who have some amazing musical chemistry. Easily recommended. Jean Beauvoir and Micki Free's American Trash is fine AOR melodic hard rock from two talented musicians who have some amazing musical chemistry. Easily recommended.